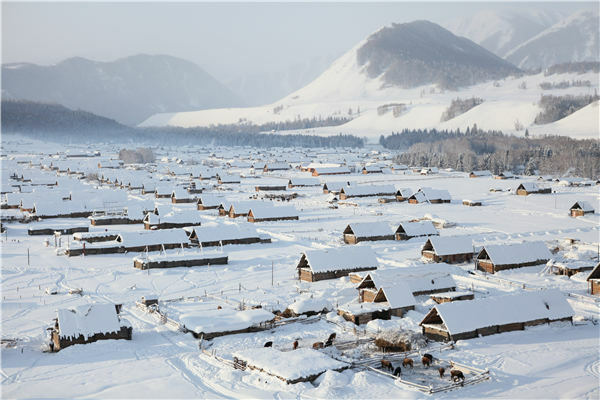 Growing winter tourism has given the homestay business a shot in the arm in Northwest China's Xinjiang Uygur autonomous region. Diverse winter fun programs and more trains and flights have heated up the region's winter. Local authorities now offer more than 130 tourism activities through March, and major scenic spots provide free or discounted skiing and dining tickets. Approximately 2.1 million tourists visited the area during the recent three-day New Year's Day holiday, up 40.58 percent as compared with the same period in the previous year, the regional department of culture and tourism reported. Tourism revenue was 1.69 billion yuan ($246 million), a year-on-year increase of 46.86 percent. All of Xinjiang Trollflower Hotel's 20 rooms were booked during the New Year holiday. "Tourists have increased a lot from the previous winter, and advance booking is required during the winter holidays," says Tang Qi, an employee with the Xinjiang Trollflower Travel Agency, which runs the homestay. The agency has special winter activities almost every week, such as ski and bonfire parties. Also, to let travelers better appreciate the local winter charm, Xinjiang Trollflower offers special tours that run from Beitun to Kanas and from Altay to Burqin to Kanas. The Trollflower is just one of the local accommodation providers that have enjoyed the boon of emerging winter tourism. Chi Binchang from the eastern Shandong province has also seen Xinjiang's tourism potential boom. "In 2003, I was only meant to travel to Hemu village in Altay, and I never expected the beautiful scenery here would appeal to me so much," Chi tells China Tourism News. But it didn't take long for Chi to decide to invest in the homestay business at Hemu. His Wusong mountain villa has seen a significantly growing number of winter vacationers since 2016. His Wusong villa took in more than 300 travelers over Oct 15 to Dec 31, up 50 percent over the same period in the previous year, according to Chi. "It is obvious that the original nine rooms are no longer enough," he says. Separately, in 2017, Chi invested a second homestay Xiyake in the region, and then went on to develop a third one Yuyuan villa in 2018 with other business partners. The Yuyuan villa's more than 100 rooms were fully booked during the New Year holiday. Most of tourists came from the Guangdong and Zhejiang provinces, Chi says. Speaking about the improved business prospects, Ma Zhonghai, a villager running a homestay at Hemu, says: "Winter tourism is doing very well, and local income (in winter) is roughly the same as summer." Ma now expects his monthly revenue to hit 30,000-40,000 yuan during the winter. Meanwhile, the local authority is also implementing policies to encourage villagers to open homestays. So, each household can receive 5,000 yuan if they promote winter tourism activities, says Wang Chengming, the deputy director of the Kanas scenic spot management committee. The incentive has attracted many local college students to return home and start up homestay businesses. At the moment, more than 30 homestays offer winter tourism services around the Kanas area, in addition to nine hotels, offering 3,500 beds, says Wang. Huang Shiming from Changsha, the capital of the central Hunan province, recently enjoyed the snow sculpture and landscape at Kanas during his visit to Xinjiang in early January. "I'd never seen so much snow in my life, and it was fun to ski and play in the snow in ways the locals recommended," says Huang, who was also impressed by the Wusong villa, where he experienced local winter folk activities. "The (room) price was good and It felt quite different sipping tea and having barbecues at the villa," says Huang.